Michael Wilson is well prepared for his first season in the Women’s Premier Soccer League. As Fortuna Tulsa coach, Wilson is leading a squad in the Central Region’s Southwest Conference. Fortuna Tulsa is the lone expansion side in its conference. 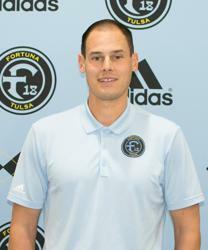 Fortuna Tulsa hired Wilson on March 2. In the process of testing for his United States Soccer Federation (USSF) B license, Wilson’s coaching experience includes serving as the head coach of Waldorf University in Forest City, Iowa. During his time in Iowa, he was named the NAIA Coach of the Year. A Scotland native, Wilson formerly featured with Elgin City in Scotland. He came to Tulsa because of what he described as fantastic owner Barry Williams and general manager Wayne Farmer and how they have developed the club. “They really care about what we’re doing,” Wilson said. “They want to do the best we can do with the resources we have available. We’re doing everything the right way. I think we’re mirroring things the professional ranks do. Fortuna Tulsa joins a competitive Southwest Conference that includes FC Dallas Women, FC Wichita, Little Rock Rangers, Texas Spurs FC and Oklahoma City FC. Wilson is particularly excited about matches with Oklahoma City FC, saying that he wants to help create a friendly, in-state rivalry between the two clubs. The two sides will face off in their first match on May 25 at the University of Tulsa Soccer Stadium. Wilson has already added some players to his roster, including goalkeeper Hannah Warner, defender Rachel VanFossen, defender Haley VanFossen, forward Yolanda Thomas and forward Anastasia Robinson. Confident in his growing roster, Wilson said the belief around the club is that it’s doing a good job. With how Wilson’s roster stands, Fortuna Tulsa is looking to add 12 more players before their training begins in early May. Assistant coaches Donivan Bradshaw and Michael Mortiz are helping Wilson navigate his roster and first WPSL coaching season. A former Division I player at the University of Tulsa, Bradshaw recently obtained his USSF A coaching license. He has been on the coaching staff of three teams ranked in the Top 10 of the Elite Clubs National League in Oklahoma. Mortiz runs Left Foot Studio Soccer in Tulsa, which focuses on individual training.